Naomi Gross and Hannah Yoder, both seniors, wrote* a petition on Jan. 31 to the Goshen College community which stated their demand for the institution to divest its accounts in J.P. Morgan Chase, the banking company which has given its support to the construction of the Dakota Access Pipeline. That day was also the day in which North Dakota senators recommended an easement passed on to them by the Army Corps of Engineers suggesting they allow the drilling under Lake Oahe and the Missouri River, both on top of lands held by the Standing Rock Sioux Tribe’s land. 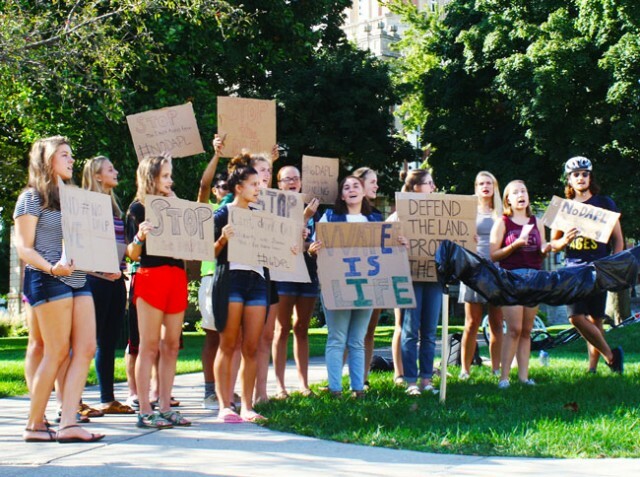 The petition reminded students of President Brenneman’s recent message to students, ensuring them of Goshen College’s commitment to social justice in these times of political upheaval. In accordance with that call to social justice, students, professors and alumni alike have signed the petition supporting the seniors’ demands for divestment. Nearly 200 signatures have been acquired, attracting the attention of the administration. Since then, the easement has been passed, allowing the continued drilling without proper environmental impacts studies. Gross, Yoder, Laura Miller, Sarah Hofkamp, Chelsea Risser and Naomi Salvador, all seniors, met with several members of the administration on Feb. 2,* to discuss possible plans for Goshen’s divestment. Glenn Gilbert, sustainability coordinator, Deanna Risser, interim vice president for finance and Ken Newbold, provost and executive vice president were the administrators present in that meeting. Recently President Brenneman issued a campus-wide email declaring his and the institution’s commitment to social justice. On January 31, ND Senators Hoeven and Cramer issued statements suggesting that the Department of Army has recommended that the Army Corps of Engineers grant Dakota Access Pipeline (DAPL) the necessary easement to drill under Lake Oahe and the Missouri River on Standing Rock Sioux Tribe land. The granting of this easement would be a clear violation under federal law, which declares that no easements can be granted before existing Environmental Impact Statements are complete. The granting of the easement could come at any moment. “Because most of us involved are seniors, we need to recruit people who will be invested in this process for years to come,” said Miller. “We need students who care about the issue, as well as students with some business knowledge.” In this sense, the college would work through the divestment alongside the students. Many of the students involved in this process have already left campus, a decision made after the easement was passed, to travel to Standing Rock in solidarity with those who continue to protest at the Standing Rock Indian Reservation. Gross, Yoder, Risser, Salvador and Deeksha Pagar, a junior, all left by car on the night of Feb. 7 to protest for the foreseeable future. For those who are interested in becoming a part of this process and conversation, email Laura Miller at lemiller@goshen.edu. *A previous version of this article incorrectly stated the two students released the statement. It also incorrectly stated that the meeting was held on Feb. 6. It also incorrectly implied that tentative plans were laid out for the coming years.